With fibromyalgia side effects, there are many perpetuating, complex factors. What we call the "straw theory" is easy to explain, and easier for those on the outside to understand. I have found in working with others who also have fibromyalgia and related conditions, that it is not always about the basic activities of daily living that we engage in. It is more about the stressors, toxins, environmental changes and anything else negative that can drive the fibro body into an extended flare.These factors affect the fibro body much differently than they do a non-fibro body. The Straw Theory is an effective way to convey to those on the outside how fibromyalgia is different and to avoid comparison of a non-fibro stating that they have aches and pains every day and that they are able go to work and function normally. Those kind of statements only undermine the reality of living with fibromyalgia side effects, the related conditions, and all of its complexity. Fibromyalgia side effects are numerous, diverse, and unnoticed by non-fibro friends and family. Both internal and external, from ongoing chronic pain and stress to heightened senses, and toxins in the environment such as laundry detergent, dryer sheets, gasoline on someone's hands from filling the car, cologne, and formaldehyde on a new piece of furniture. 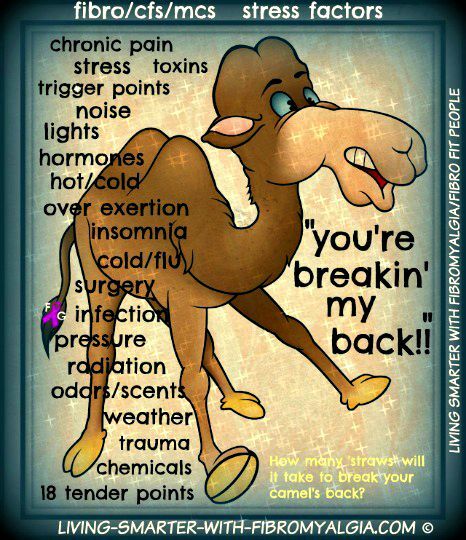 These mostly go unnoticed by those around you; yet, as you are exposed to one after another of these fibro side effects, the result is cumulative until your "camels" back breaks. The resulting "flare" can be devastating. Just as bad, the offending family member cannot relate whatsoever to you being poisoned by his cologne. That can be "rock and a hard place" situation for you. The stress that we fibro bodies feel from heightened senses and stimulants around us also creates one "straw" after another and eventually we break down from these multiple exposures. This is not the kind of stress that anyone would thrive on. This is a damaging and debilitating kind of stress that creates an overload on the already vulnerable fibro body. When fibromyalgia side effects lead to a ‘headache’, you have a headache in the realm of the fibro body which again is different in the sense of severity and active trigger points that might be perpetuating the headache. This is the kind of headache that doesn't so easily respond to a pain medication, again due to the nature of fibromyalgia and it's many variables. Fibromyalgia side effects could stem from various factors within the fibro body, from active trigger points, to stress or from external factors such as environmental toxins. The headache could be more localized in the sinus, eyes and facial area or it could stem from common trigger points in the scapula and neck area that radiate to the entire head causing a migraine type headache. 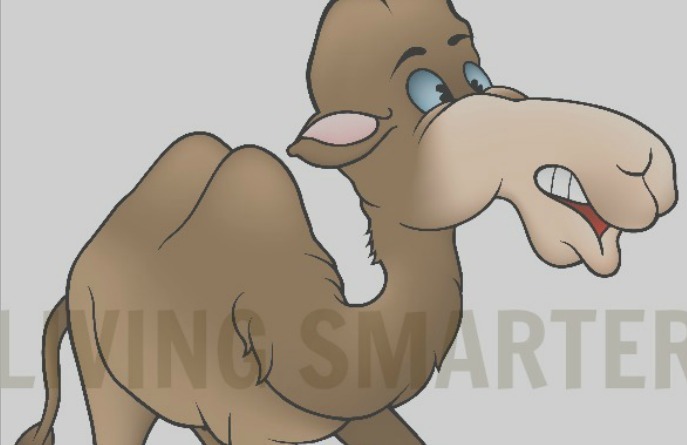 The Straw Theory simply means that too many contributing factors will build up and ultimately “break” our camel’s back and often put us into a fibro flare that will increase both symptoms and pain. The adjacent graphic shows a variety of "straws" that can perpetuate fibro side effects. These are the kinds of things that can lead to a flare within a short period of time or exposure. NOTE: Refer to the "Fibro Flare" and the "Environmental Toxins" articles at the bottom of this page for more info. So, what are some of your straws? For me personally, one of my biggest "straws" is going to an enclosed shopping mall. I know I say this often, but this can be a very toxic place. There are many toxins from new materials, synthetic fragrances, cleaning chemicals and more. You might think that it is the physical walking, stopping and standing that is getting to you at the mall. But it could be a combination of these, along with the various toxins wafting through the stores and mall. And then before you know it, you are not having the fun experience you expected. Or maybe you have experienced this enough times, and like me, you just know that you might need to limit your time there, but not forego it all together. Remember that walking around a mall is much different from structured exercise. The stopping and standing can be harder on the body than continuous focused movement. When a person with fibromyalgia does not get restorative sleep, this affects their body to a greater degree than a non fibro person. Again, we are going to be more vulnerable to everything, including lack of restorative sleep. We cannot just use stimulants to get going. In fact, because every organ suffers from lack of restorative sleep, this puts a great deal of stress on the brain and liver especially. Therefore, loading up with caffeine, will not work for the fibro person. It can lead to more anxiety, and adrenal gland and thyroid issues. That is why we always suggest using fibromyalgia specific adaptogens in the morning. Our cortisol is higher in the morning anyway, and that just happens to be when many people with fibro feel their worst. Adaptogens such as Ashwagandha, Holy Basil, Eluethero or DHEA, only in the form of Keto-7, can help to lower stress levels and subsequent negative effect on the body. Of course, nothing can take the place of restorative sleep. I have found these particular ones to be most safe and effective for reducing stress in fibromyalgia. When you have an exposure to environmental toxins, this affects the fibro body in a way that can cause an extended “flare" and increase of both pain and symptoms for hours, days and sometimes longer. I know this to be true personally as my symptoms first started at the age of 9 with severe reactions to environmental toxins. At the time, our home was being remodeled, and I reacted to everything from new flooring, paint, furniture and anything that contained chemicals such as formaldehyde. The first symptoms for me presented in the form of severe migraine headaches and often vomiting due to the extreme pain. I have MCS so I react to almost any exposure immediately. The one good thing about that is that I can and do take immediate steps to get away from that exposure if possible. Also, I believe that any toxin that is bad for a MCS person is also bad for a fibro person. But, non-mcs fibro people may not react outwardly or quickly. Consequently, the exposure can be extended or a series of exposures to different substances may happen and those exposures are cumulative. And those exposures become side effects or “straws”. Fibro people can only take so many “straws” until it breaks their camel’s back and leads to flares. Worse yet, if they do not realize why and therefore continue to be exposed day after day, very severe fibro flares can result. I also remember the smell of something at school that I couldn’t place but none the less, it would cause the start of a massive migraine. Years later as an adult, I realized that “smell” was pesticides that were used in schools for pest control. Hey, I get it, they needed to prevent roaches and other critters from running around the lunch room and scaring the kids (not to mention being a health hazard) but that exposure to pesticides didn’t help me and at least one time, sent me home from school with not only a severe migraine but vomiting and partial loss of my vision. I was just a child. I enjoyed school. These symptoms most definitely were not exaggerated by me in any way…they were and still are very real! Yeah, I sure do get it ….and that is why we focus on this “variable” throughout the website here. Avoiding toxins and establishing a safe haven at home is a critical step to living smarter. You really need to take this seriously. This goes for any other illness such as cancer and heart disease. Yes, even heart disease has now been linked to toxins in our environment. This means everything we put on our bodies and everything we use in our homes. As I often say, it’s also important that our family members be on board. We cannot control all toxins in the “outside” world, but we can at least take more control over our own environments in which we spend much of our time. Work environments are more of a challenge, and I have experienced that many times. Do the best you can to be assertive about your needs if you work in an environment that could be contributing to symptoms. Let us all work to be more proactive and less reactive. Let us not allow too many “straws” to break our camels back. Please remember that "the more we limit ourselves, the more we will be limited" So it is less about avoiding the daily activities and joys in life and more about avoiding the negativity and toxic exposures to environments, relationships, habits and 24/7 illness talk.